One of the first times I had the chance to taste wine from a barrel was when I was living in Washington and went to a tasting at Merry Cellars. Tasting wine at this very raw state was fascinating and I have enjoyed each opportunity to taste from the barrel I have been given. 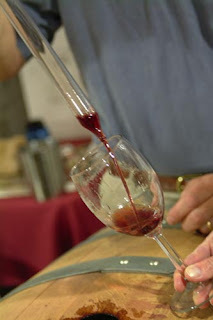 Tasting wine before the bottle allows for some prediction and mystery of what the wine will become. For the first two weekends in March I get to play fortune teller again while participating in the 33rd Annual Barrel Tasting. Over the two weekends of March 4-6 and March 11-13,over 150 wineries will be participating in this spectacular event that drew over 25,000 attendees from 47 states in 2010. A ticket costs just $20 in advance and $30 on site covers one weekend and gets you access to three days of barrel tasting from all the wineries and the opportunity to purchase wine that will be available upon bottling. Often, these "futures" purchases will be deeply discounted and may only be available for sale in that form. While purchasing wine only tasted from the barrel involves some risk, it is no different than buying a bottle and holding it for years while it develops. Wineries from the AVA’s of Dry Creek, Russian River Valley, and Alexander Valley will showcase some of the best wines that Sonoma County has to offer and what you can expect to see in 12-18 months. I will be providing coverage on the first weekend and focusing primarily in the Alexander Valley AVA. Known for its Cabernet Sauvignon, Zinfandel, and Syrah, the Alexander Valley features common names such as Clos du Bois, Rodney Strong, and Coppola, but is also home to many small family owned wineries as well. Watch for tweets along the way and future posts detailing the event.